Learn more about Lake Erie by exploring its rich history and experiencing science up close at the Aquatic Visitors Center on Lake Erie’s South Bass Island near Put-in-Bay, Ohio. AVC tours are free and open to the public from 10 a.m. – 5 p.m. Wednesdays through Saturdays June 19 – August 24. Group tour reservations are available in mid-May through October at a cost of $4 per person. A lifelong love of fishing can be sparked on the Aquatic Visitors Center fishing pier, where children under age 16 can fish for free! Children can borrow fishing gear and snag some bait, provided by the ODNR Division of Wildlife. They often reel in bluegill, pumpkinseed, bass, or yellow perch, but you never know what might bite! Kids can even learn about the food web as their freshly caught round gobies, an invasive species, are fed to the hungry fish in the Aquatic Visitors Center’s aquaria. 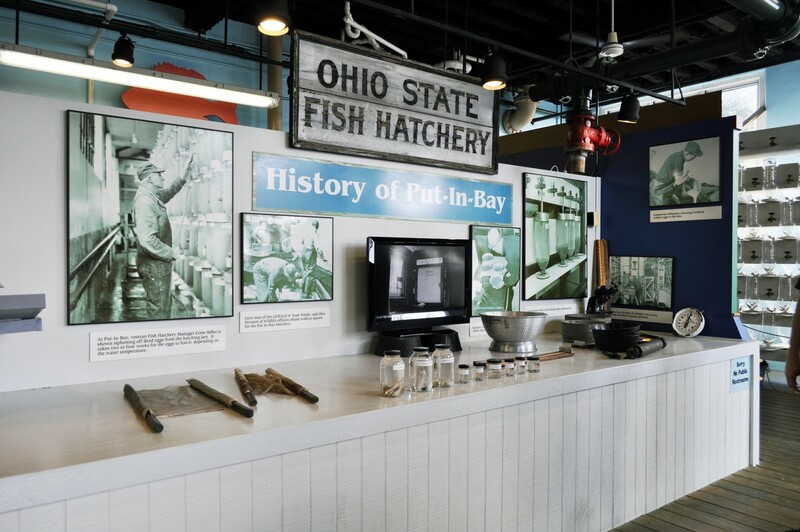 Currently operated by Ohio State University’s Ohio Sea Grant, in partnership with the Ohio Department of Natural Resources (ODNR) Division of Wildlife, the Aquatic Visitors Center served as the State Fish Hatchery at Put-in-Bay from 1907 through 1988. In its more than 80 years of operation, the hatchery raised a variety of fish species, including walleye, sauger, whitefish, herring, yellow perch, coho salmon, chinook salmon, and steelhead. Hatching jars, raceways, and other artifacts from those by-gone days are still on display. In 1992, ODNR Division of Wildlife converted the hatchery building to the Aquatic Visitors Center, an educational facility to bring history, fishing information, and hands-on activities to the public. Ohio Sea Grant took over management in 2009, continuing to teach the next generation about the importance of protecting Lake Erie. Ohio Sea Grant and the ODNR Division of Wildlife lead the way on research to solve the most pressing problems facing Lake Erie. Some of this research takes place on-site at the neighboring Stone Laboratory, the nation’s oldest biological freshwater field station and Ohio State University’s island campus on Lake Erie. At the Aquatic Visitors Center, guests learn about current research projects investigating topics like walleye tracking, aquatic invasive species, the dead zone, and fish biology.